Niles Color Center has built a solid reputation as a supplier of quality paint products. It's almost impossible to not find the paint you are looking for within our extensive lines of paint. If you don't find what you're looking for listed below or have any questions call us immediately at (847) 967-9585 or E-mail us at ColorCenter@aol.com. 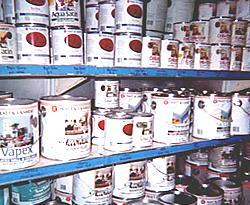 Chances are if you are looking for paint, we can find it for you! Best of all, Niles Color Center ships our products throughout the United States! Below is just a small listing of some of our largest suppliers. Pratt & Lambert - Pratt & Lambert has manufactured high quality products since 1849. In the 80's, Pratt & Lambert introduced new acrylic resins in the manufacture of its paint and developed the Accolade line of products - the best interior and exterior finishes available today - rated the #1 interior eggshell finish by Consumer Magazine. Pittsburgh - You work too hard to paint with anything less. Pittsburgh Paints brings out the designer in you with a sparkling portfolio of the latest color fashions for your home painting and decorating needs. Olympic Stains has been dedicated to producing the finest quality exterior stains since 1929. Today, they combine this heritage with the latest technology to offer the highest quality oil stains, latex stains, exterior clear finishes, and exterior specialty products. Muralo - Developing and pioneering water-based technology since the 1890's, Muralo continues to be a technological innovator in water-borne paint products that offer superior performance and appearance. We do custom matching with not just eye matching, but professional computer matching. Bring in your sample and we will match it for you. There is absolutely no charge for this service.